A few years ago, West Central Initiative worked with the Annie E. Casey Foundation to create an approach to helping low-income working families in west central Minnesota thrive. Rural Family Economic Success, or RuFES, as it's called, is a framework based on three components: Earn it. Keep it. Grow it. These goals describe what families need to do to achieve economic success. 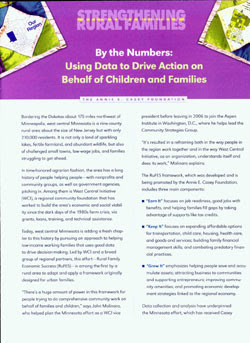 Recently the Annie E. Casey Foundation published a paper on how WCI helps implement the RuFES approach in west central Minnesota. Take a look. You can also find it on WCI's Web site home page, www.wcif.org.